What Was the Detroit Geographical Expedition and What is its Relevance Now? 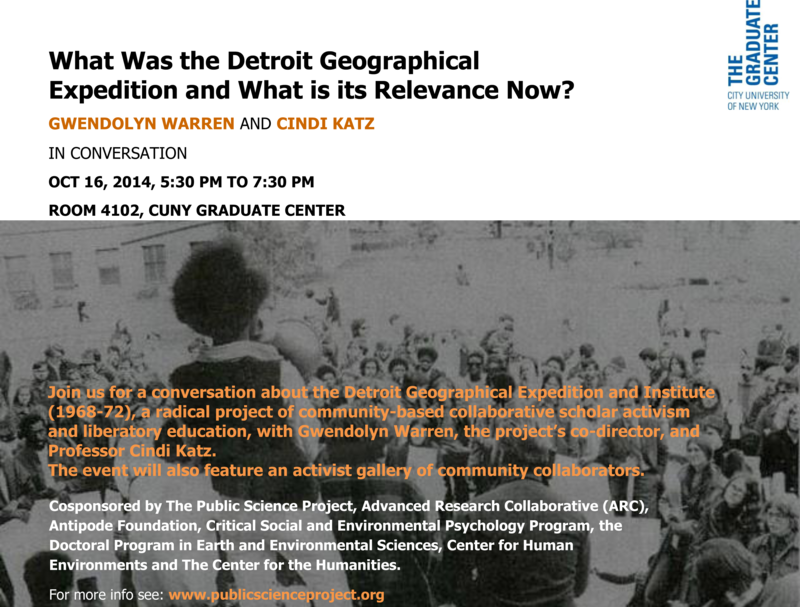 Join us for a conversation about the Detroit Geographical Expedition and Institute (1968-72), a radical project of community-based collaborative scholar activism and liberatory education, with Gwendolyn Warren, the project’s co-director, and Professor Cindi Katz. As a teenager, Warren shaped many of the DGEI’s mapping projects and was a leader of its extraordinary educational component, which brought hundreds of young people from Detroit to Michigan State University, where they formed a sort of autonomous university. Revolutionary in its implications, and not surprisingly short-lived, the collaboration has had powerful repercussions for generations. While the focus in the current political era is too often on ‘stakeholders,’ relies heavily on the ‘non-profit industrial complex,’ and depends on ‘big data’ for developing policies, the DGEI offers a compelling example of democratizing the intentions, practices, and uses of research. The event will also feature an activist gallery of community collaborators. The event is free and open to the public. The Graduate Center, CUNY is located on 365 Fifth Ave btwn 34th & 35th.